These nocturnal animals are known to live in urban areas, often taking shelter in or near humans’ properties. They particularly become comfortable underneath buildings or in attics, especially when it’s an adult female nursing a family. Opossums will do whatever it takes to get what they need to live, including seeking out trash, birdseed, and pet food. While they’re typically gentle animals, they’ll defend themselves if necessary. In additional to causing property damage, opossums can carry dangerous diseases. They’ll leave feces around a property and in swimming pools. Opossums can be easily identified by their grayish fur, pointed noses, and long prehensile tails that can grasp and wrap around objects. They can grow to be between 10 and 14 pounds and they have an opposable hallux on each of their rear feet which helps them climb trees. Opossums are marsupials which means that their young spend the early part of their lives within their mother’s pouch and they tend to mate in the winter months. After spending 1 to 2 months in their mother’s pouch, young opossums will cling to their mother’s back for about a month before they become independent. Female opossums may have up to 3 litters per year. Opossums occupy several habitats including deciduous forests, woods, and wet areas such as marshes and streams but they are also abundant in urban areas. They are omnivorous and will eat just about anything including plants, insects, small animals, dead animals, and sometimes garbage. Their constant search for food makes them nomadic animals but they may sometimes build a home in manmade structures such as decks, sheds, and patios, or within homes. When they feel threatened, they may show their sharp teeth and hiss but they prefer to slip into a catatonic state and “play dead” rather than fight. 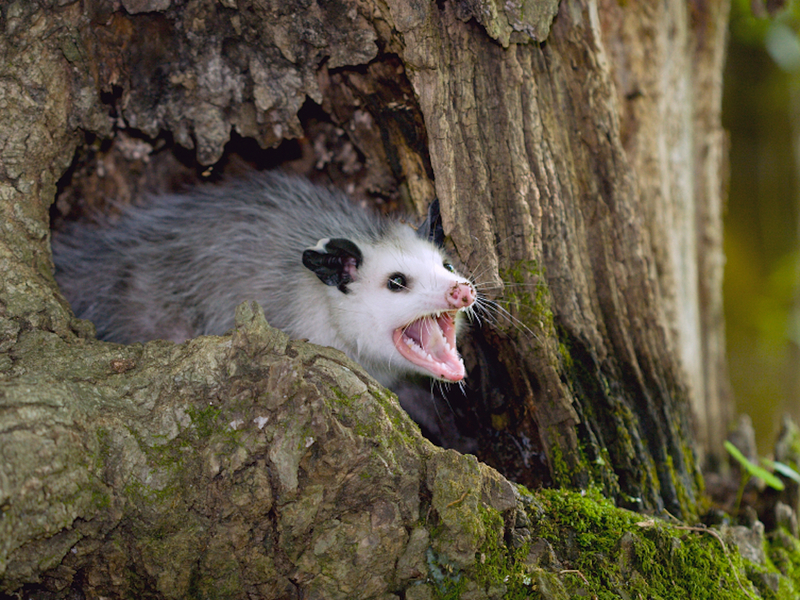 It is illegal to trap and remove opossums without the proper permits which is why you should call Groen’s Wildlife Services if you have a nuisance opossum on your property. Our professional technicians are state licensed, certified, and insured to provide effective opossum removal services as well as exclusion services to prevent the animal from returning. We use safe and humane trapping methods and we will also deodorize your home and repair any damage the opossum may have caused.